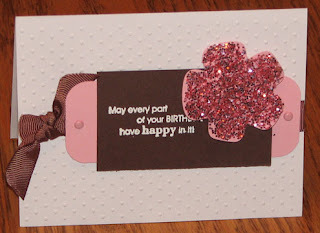 From the Stampin Up mini catalog, I bought a pack of the chunky glitter. I haven't used it very much, but I decided to use it on this card and I like the effects. There is a similar card in the catalog and I just used the basic design. The ribbon, cardstock, stamp, embossing powder, and glitter are all from Stampin Up; I cut out the flower from the Walk In My Garden cartridge with my cricut; the brads are from Making Memories; and I used the Swiss Dots embossing folder in my cuttlebug to emboss the background. Congrats on your blog hits! The blog candy looks awesome! Thanks so much for offereing this!!! I liked your card. It was pretty. I do not get to do alot of girly stuff, because I have a boy.